Phoenix Wright does for the legal profession what the Trauma Center games do for medicine, which happens to be pretty much the same thing McDonald’s does for fish; sliced it open and yanked out its guts until nothing remained except the few tasty remnants that everyone likes, then padded it out with a nice slice of cheese and a bun to make it appetizing. While my initial reaction may sound like I don’t like the game, keep in mind that Court TV and the Surgery channel really don’t rank as high in the ratings as such masterpieces as “The Bachelor” and “Jersey Shore.” I’d like to make a joke here about viewers’ preferences, but reading through the Wikipedia page on Jersey Shore doesn’t really give me any information on what the show actually is. So as it stands, most people would rather watch 42 minutes of nothing than to learn anything–anything at all–about medicine or the legal process. …we’ve got endless hours of Scrubs, E.R. Chicago Hope, M*A*S*H, Doogie Howser, Grey’s Anatomy, House, Ally McBeal, Night Court, the People’s Court, Judge Judy, Judge Joe Brown, JAG, Perry Mason, Law & Order, Law & Order: Criminal Intent, Law & Order: LA, Law & Order: Special Victims Unit, and Law & Order: Trial by Jury. Just to name a few. So while the Anime Kabuki Courtroom Melodrama that is Phoenix Wright may not prep us very well for the LSAT, we can sit back and enjoy it simply for being an Anime Kabuki Courtroom Melodrama. Phoenix Wright: Ace Attorney tells the story of a 24-year-old who clearly has not aced his profession and only barely qualifies as an attorney. While the life of the NDS hasn’t entirely ended yet, this game holds a special distinction of “retro,” as gameplay derives from the standard point-and-click adventures of ages long past. Playing as Phoenix, you explore crime scenes to collect data and evidence to help build a case in defense of your clients. You can talk with witnesses and other key figures, present them with evidence you’ve found to initiate reactions which lead to more information, and use the DS touch screen to zero in on specific details of a scene you’d like to examine. 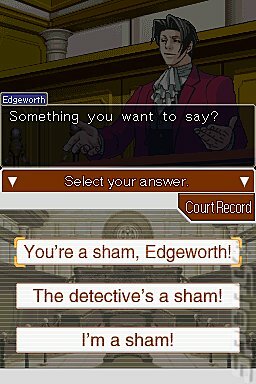 At regular intervals in the investigation, you enter the courtroom, where you listen to witness testimony and try to point out all their flaws either by presenting them with your evidence or by shouting out any obnoxious thought that pops into the game writers’ heads concerning key statements in their testimony. While the game springs from the genre of murder-mystery, it also puts a new twist on the subject. Most of the time, the player knows who dunnit from the beginning of the case, and in all five cases, you figure out the identity of the murderer well before the end of each episode. The real genius of Phoenix Wright is not in guessing who the criminal is, but requiring the player to provide proof that pins them to the crime. This eliminates the possibility for intuition, “cop instincts,” personal bias, “just knowing,” and all the other special-kind-of-stupid arguments that my students use every time I assign a researched persuasive essay. A goal that aims for evidence instead of the verdict? Can I require video games on my syllabus? Murder mystery retains popularity from the satisfaction people get when the figure out the mystery. People like to feel smart, but sometimes picking through evidence can feel like trial and error. And you can’t really influence the story any other way, not being able to communicate with the game takes you out of the story. I felt even worse when I figured it out, then presented my evidence, and they explained an entirely different course of events than those I suspected. 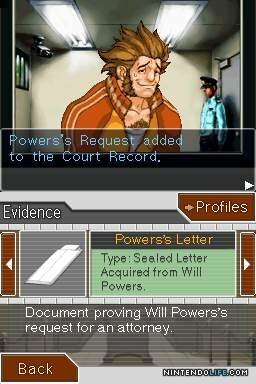 During the final case, the sheer amount of evidence and difficulty of the logic forced me to look up a walkthrough a few times, and at one point after looking up what I needed to present and hearing the explanation given in the story, I still didn’t understand how point A led to point B.
Compounding the frustration, Phoenix Wright: Ace Attorney relies on text more than most games. While I’ll admit that every word did serve a purpose and they probably couldn’t have trimmed the story much more than they did, it does make the game, especially the later, more difficult trials, drag on much longer than I really enjoyed. At the very least, they could have offered us the option to skip through text we’d already read, or maybe just changed the system to display all the text in each box at one time, rather than spelling it out for us letter-by-letter as though some tiny stenographer living in the cartridge were transcribing the dialog for us in real time on a sticky typewriter. Also obnoxious: the game’s insistence on display any emotion other than bland disinterest by having the screen flash white and shaking the character sprites. By the end of major revelations an a-ha! moments, I felt like I needed aspirin and a break from the game to prevent myself from having a seizure. As mentioned, the localization team seemed to drop all pretenses of courtroom verisimilitude, dropping ideas like “innocent until proven guilty beyond reasonable doubt,” confusing the fifth amendment right not to self-incriminate as a special right held by the police chief to refuse to give any sort of testimony, requiring the real murderer to be unmasked before a “Not Guilty Verdict” can be declared, and my personal favorite, implying that murder by accident or self-defense still qualified for prison sentences, which implies the characters follow the Divine Command Theory of morality, which the western world abandoned a thousand years ago (Look it up…it’s used in Beowulf) in favor of judging people by their intentions instead of just their actions. But really, accurate courtroom procedure would prove even more tedious than reading through a novel of flashing text letter-by-letter. Phoenix Wright keeps us entertained by forcing it’s players to think through the evidence to solve murders while amusing themselves by the dramatic kabuki poses made by the characters as they battle wits. I’d like to look into the sequels, just maybe not right away. This entry was posted in Nintendo DS, Phoenix Wright and tagged nds, Phoenix Wright. Bookmark the permalink.